138 min. Warner Brothers. Director: Clint Eastwood. Cast: Kevin Costner, Clint Eastwood, Laura Dern, Bruce McGill. 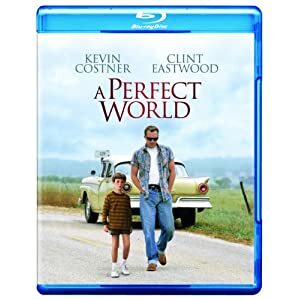 Daddy issues abound in A Perfect World, Clint Eastwood's follow-up to Best Picture winner Unforgiven. A surprisingly incisive script by John Lee Hancock (The Blind Side) tells the tale of an escaped convict and his eight-year-old hostage and, in the process, considers the cycles of disappointment wrought on sons by questionable fathers: abusive ones, absent ones, even a well-meaning "daddy state." In 1963 Texas, Butch Haynes (Kevin Costner) goes on the lam in the company of fellow inmate Terry Pugh (Keith Szarabajka). Compared to the volatile Terry, the laconic Butch is a model of self-control, but it doesn't take long for the pair to find themselves surrounded in suburbia, prompting Butch to take eight-year-old Phillip Perry (T.J. Lowther) as a hostage. Wild card Terry is out of the picture soon enough, leaving Butch and Phillip to develop an oddly co-dependent relationship. Raised a Jehovah's Witness among three "split-tails" (as Terry describes the boy's sisters and mother), Phillip feels inadequate as a male. His religious mother has allowed him no boyish adventures or indulgences, which creates a perfect storm of emotionally vulnerability to Butch's take-charge presence: here, at last is a man, defined by power and independence. Conversely, Butch wishes he were Phillip. Likewise fatherless, Butch first killed a man when he was Phillip's age, and looking at his captive, Butch cannot help but ponder the mystery of the man he has become and ache to give the boy some useful moral support, to help the boy become the winner Butch could never be. Ostensibly, A Perfect World is a crime drama, with Eastwood's old-school Texas Ranger Red Garnett and Laura Dern's newfangled criminologist Sally Gerber tracking Butch and Phillip along the backroads. But under that surface and aside from tonal missteps into near-broad comedy, here is a psychodrama, further complicated by Garnett's role in the man Butch has become. As the film's "elder," Garnett once held Butch's fate in his hands, and influenced a judge to institutionalize the teen offender and thus remove him from the bad influence that was his father. Garnett now has cause to second-guess his once-upon-a-time paternalistic righteousness as a symbolic "father" whose word was literally law in determining Butch's fate. Meanwhile, as Phillip takes to wearing a shoplifted "Casper the Friendly Ghost" Halloween costume, Butch feels haunted by his past, and the boy tentatively, excitedly tries on different roles: he enjoys playing a bandit in emulation of his new father figure, but ultimately identifies more with the benign Casper. The poky pace can be both a patient strength and an indulgent liability over the course of 138 minutes, and the scenes amongst the lawmen tend to be clumsy, but more importantly, A Perfect World boasts a strong script, confident direction, and subtle, resonant performances from Costner and Lowther. The filmmakers admirably intend to explore and understand their characters in their complexity rather than lionize or demonize them: Butch, in particular, never stops being a damaged, dangerous man despite his tender regard for Phillip. The film is at its best when not spelling out its points, one of which is the neverending hurt of abuse (replayed multiple times in Butch and Phillip's journey) and another that's implicit in the 1963 Texas setting: innocence is about to be lost at the end of a riflepoint, for a boy and for a nation. Warner gives A Perfect World its Blu-ray debut with a handsome hi-def transfer that ably recreates the film's theatrical appearance with no unnatural digital sheen. Light grain gives the picture that natural look, and color and contrast are accurate to the source. Black level is sturdy, and detail (especially in textures, like fabrics) quite good. Along with a DTS-HD Master Audio 5.1 mix that maximizes the source material for a definitive lossless audio presentation, this Blu-ray disc makes a worthy upgrade from standard definition. That said, the sole bonus feature, unfortunately, is the film's "Theatrical Trailer" (1:57, SD). All site content © 2000-2019 Peter Canavese. Page generated at 04/23/2019 08:42:23AM.